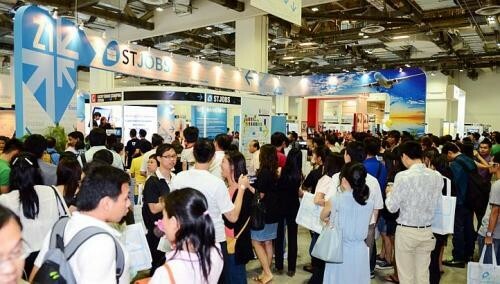 SOME 52,000 people attended this year's STJobs Career and Development Fair at the Marina Bay Sands Expo and Convention Centre. The two-day annual event, which ended yesterday, is one of the largest job fairs here, with some 200 employers from 16 industries taking part. They include major players such as Singapore Airlines, Keppel Offshore and Marine, and insurance giant AIA Singapore. New at the fair this year was My Visume, a job application tool introduced by STJobs - the Singapore Press Holdings' online jobs portal - which records video resumes. Ms Kee Ee Kheng, STJobs senior product manager, said Visumes can help applicants stand out from the crowd. "While a paper resume may be easier to read, making a Visume to complement a traditional CV (curriculum vitae) creates a visible impact." Fresh graduate Rachel Ng, 22, said she enjoyed trying out the Visume tool. "It is unlike a traditional resume, and will make my job application more appealing." Separately, about 20,000 students and parents turned up at the Cats Recruit Scholarship and Top University Fair yesterday at Suntec Singapore. The event, organised by Cats Classified, featured almost 40 universities and 18 scholarship boards from countries such as the United States and Britain. View Career Fair Jobs here. View Career Fair photos and watch video highlights here.